(ALSO VEGAN) This is a traditional, 100% Olive Oil, Castile Soap. It is a very gentle, moisturizing, mild soap with a creamy, almost lotion-like lather. Mild enough to use on children, babies, and sensitive skin. Calendula Extract has been added for it's skin soothing properties. Small amount of sugar is added to boost lather. 100% Pure Olive Oil, Water, Sodium Hydroxide (Saponified), Sugar and Calendula Extract. All natural (also vegan) soap. Made with real orange blossum water, sweet orange essential oil, moroccan red clay. Smells so much like the orange blossums that bloom this time of the year! This soap doesn't smell typically like you would think....The first scent you will smell is Sweet Orange Essential Oil and then a scent of the earthy, hoppy scent under that. This soap has a yummy Chocolate scent with a refreshing Spearmint background. Has a mild, cool feel to it. A clean, fresh lemony scented soap with the creamy feel of goats milk. The beautiful natural yellow color comes from the addition of tumeric in the soap. Smells like a lemon meringue pie. This soap has a refreshing clean, crisp scent of rosemary and peppermint essential oils. The peppermint** essential oil gives this soap an invigorating, cooling sensation. ***Please be aware that the mint may be too fresh near the eye and sensitive areas of the body. This natural soap is made with Cedarwood & Sage Essential Oils. 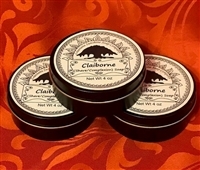 Has an “ earthy herbally” scent that great for both women and men.